Pollution, lack of exercise, poor eating habits can weigh down the body; for this comes a clever mix of valuable medicinal plants useful to facilitate purification. The milk thistle, known to facilitate cleaning and proper liver function, joins the Elder, known for its antioxidant action, and fennel, useful to reduce bloating. Licorice and Rhubarb complete the formulation, facilitating the digestive processes and the regularization of the intestinal transit. Mint, along with licorice and fennel, herbal tea provides the ideal taste for them to show off their moment of happiness. 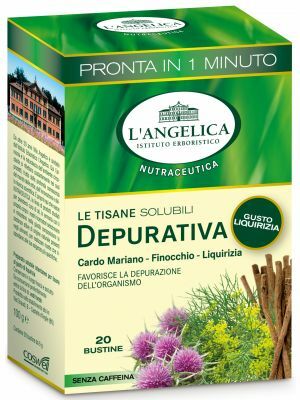 INGREDIENTS:Peppermint (Mentha piperita - leaves) 24.5%, Elderberry (Sambucus nigra - flowers), Fennel (Foeniculum vulgare - seeds), Milk thistle (Sylibum marianum - seeds) 11%, Rhubarb (Rheum off./palm. - root ), Licorice (Glycyrrhiza glabra - root) 10%, China (Cinchona officinalis - bark). NUTRACEUTICAL HERBAL TEAS are the ideal remedy to take care of ourselves in a natural, non aggressive way, and above all according to our body’s rhythms: if regularly taken, and along with a balanced and diversified diet, they help to achieve a healthy lifestyle. NUTRACEUTICAL HERBAL TEAS contain only the best herbs, carefully selected, to help us solving the minor diseases which may affect our daily well-being.